On the shores of the vast Arabian Sea, is a city with the sobriquet ‘Queen of the Arabian Sea’. In this historically rich city, Kochi, sits an edifice built on a 10-acre plot in all its splendour, in Vytilla, Maradu. 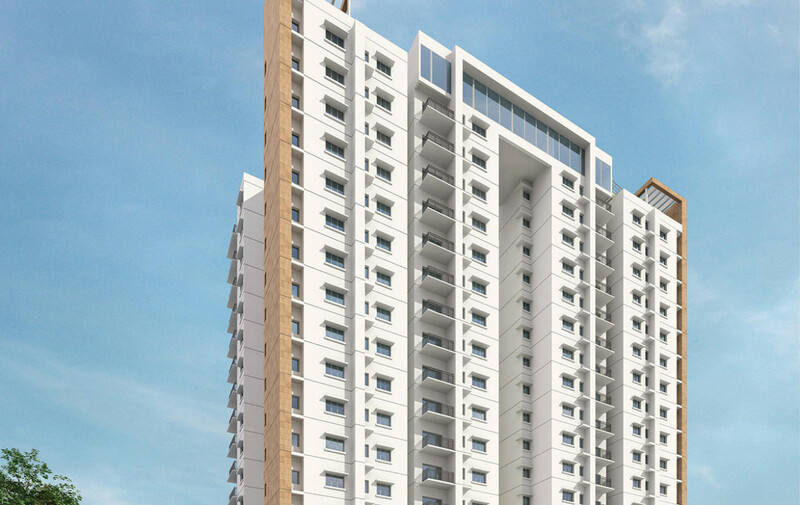 A towering beauty reaching out to the skies, Prestige Cityscape sets a prelude for future architects! 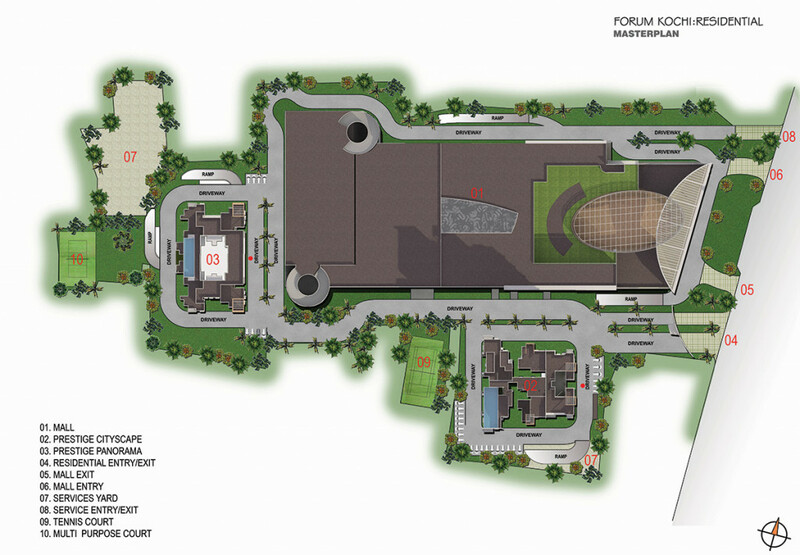 Spacious, luxurious, and conveniently situated, Prestige Cityscape has the renowned ‘Forum Mall’ in its premises. 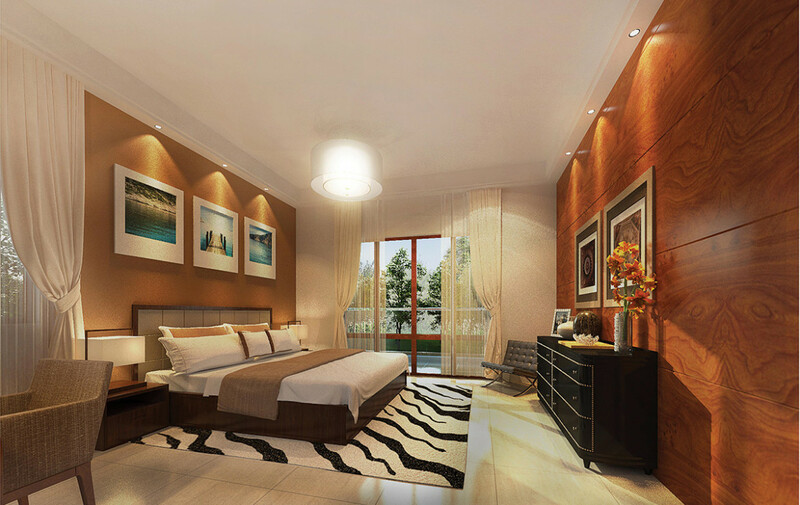 The apartment is placed distinctly away from the mall to preserve the serenity of the abode. The development accommodates spacious three and four bedroom homes with a separate maid’s room that has independent access. 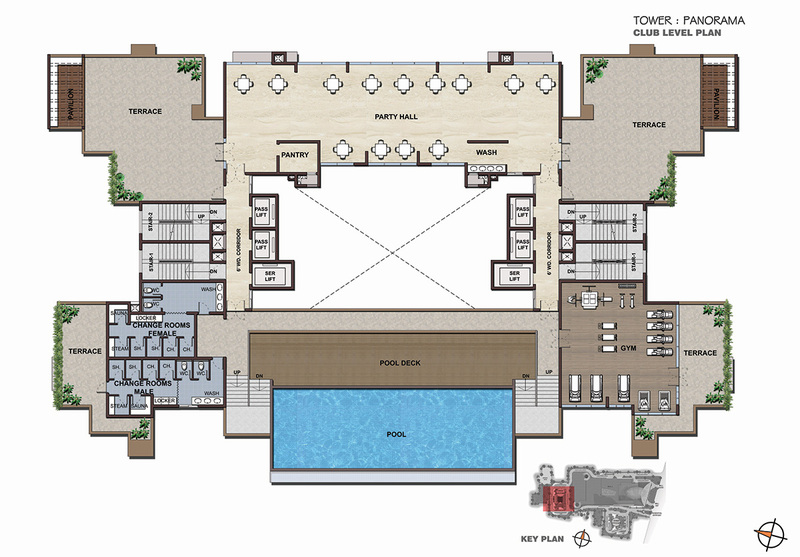 A well integrated clubhouse on the 18th floor is replete with a Gym, Party Hall and Swimming Pool. 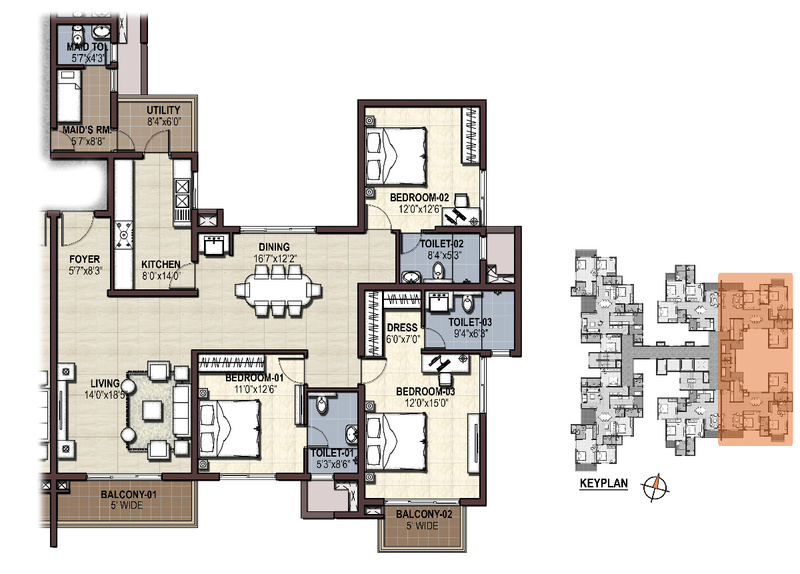 There is an abundance of natural light and ventilation in each apartment as a result of its flawless orientation. 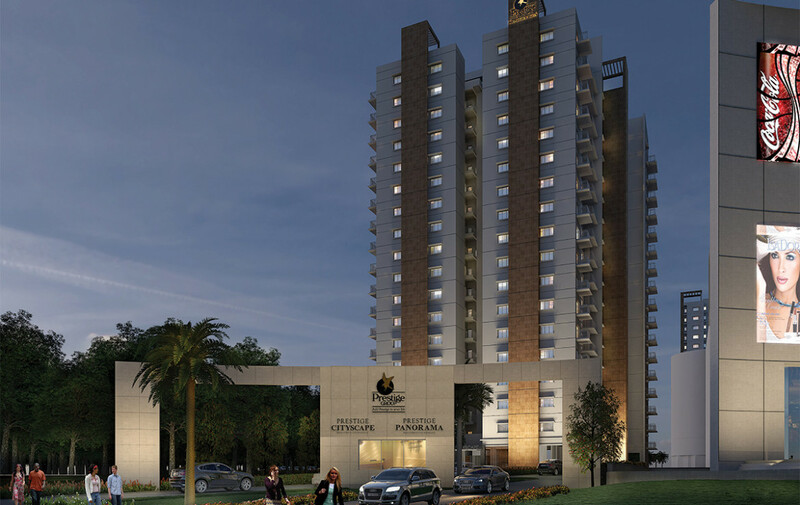 ‘Prestige Panorama’ by the Prestige group offers spacious two and three-bedroom apartments that are an epitome of luxury. A well planned and judiciously designed, contemporary development, each home has a perfect balance of space, ventilation and natural lighting. 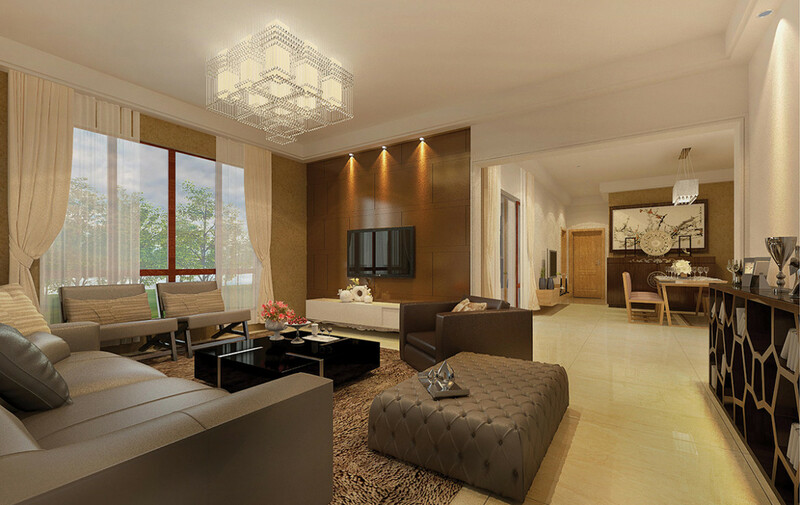 Equipped with all amenities, it ensures that you live the comfortable life you always wanted to live. Avid fitness loving residents can use the gym and finish off with a refreshing swim at the well-integrated club facility on the 18th floor. 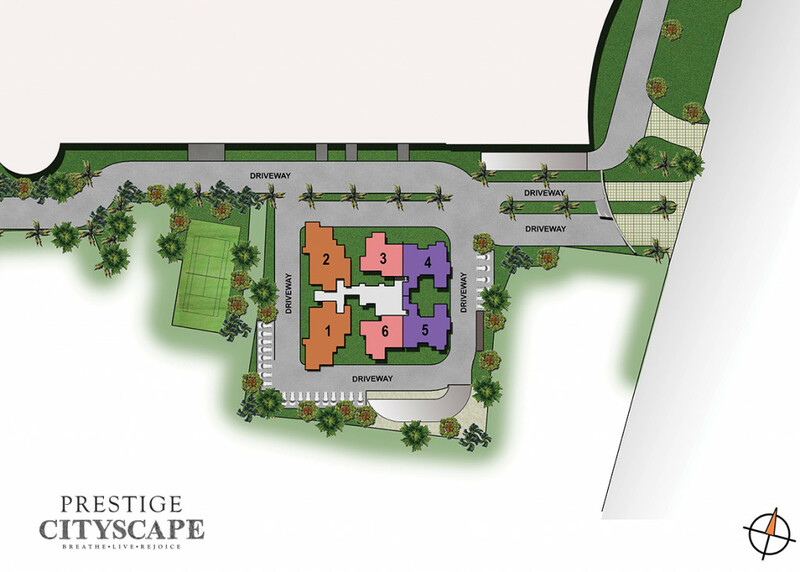 Click here to download the Cityscape brochure. 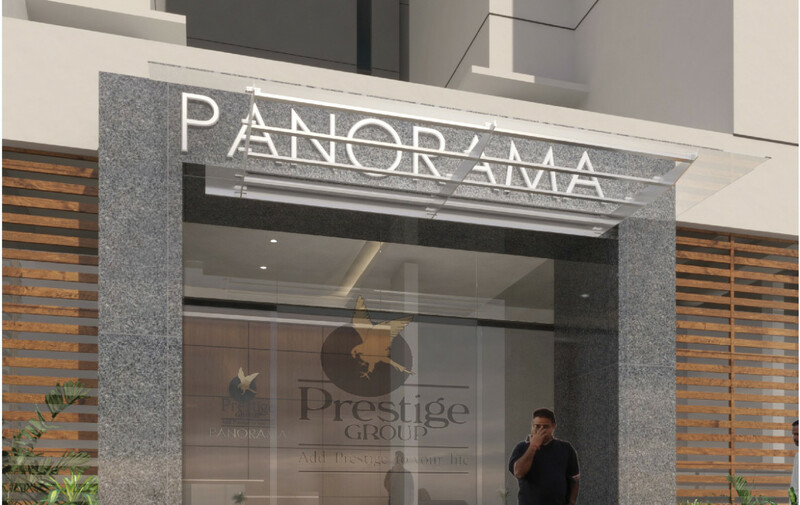 Click here to download the Panorama brochure. External and Internal walls of solid concrete blocks/table molded bricks. Internal walls – Cement plaster with putty finish External Walls – Cement Plaster. The main entrance lobby will be done in a combination of granite and textured paint. Vitrified tiles and textured paint will be used for the upper floor lobbies. Staircase will be finished with Kota stone. 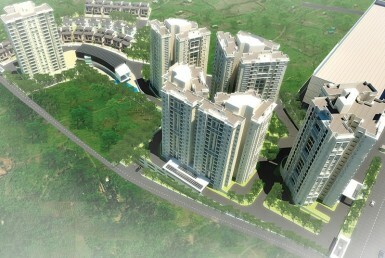 Two passenger elevators of suitable capacity and one service elevator will be provided in each block. Polished granite platform with stainless steel sink and drain board with single lever sink Mixer. Ceramic tile dado of 2 feet above granite counter. 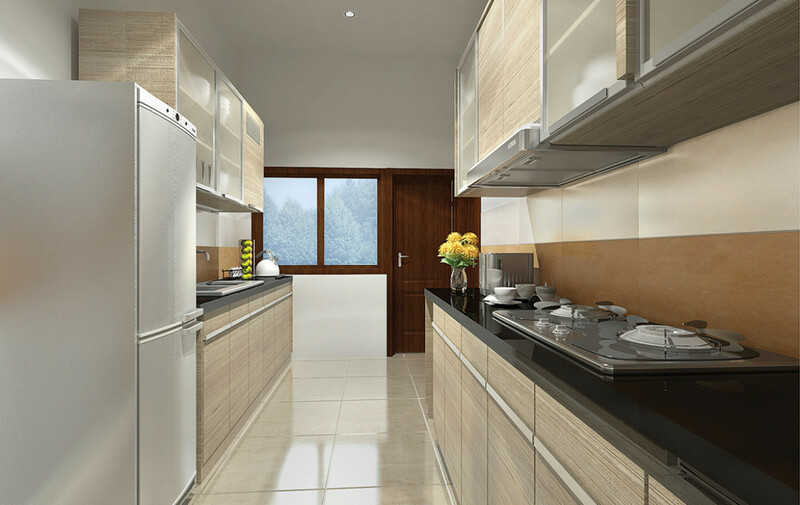 Superior quality Ceramic tiles for flooring and dado up to false ceiling. EWCs (make Hindware/Grohe or equivalent). Granite top with semi-recessed wash basin and single lever mixer taps. Concealed conduits with copper wires and suitable points for Power and lightings. Provision for split ACs/ledge in the living area and all bedrooms. Wiring for cable TV will be done. Television points in living room and in Master Bedroom. CCTV surveillance system, video door phone. Corporation water supply will be given in the kitchen and borewell water will be provided for all points in the rest of the unit. Telephone points in living/dining room and in all bedrooms. Generator will be provided for all common services. In additions, 100% backup will be provided with additional costs (operating cost to be borne by the client). Professionally designed & executed multi-level landscaping. 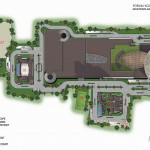 Swimming pool, Gymnasium and Party hall on 18th floor of both Prestige Cityscape and Prestige Panorama. Internal Walls: Plastic Emulsion for all plastered walls and ceilings. External Walls: Textured paint/Exterior quality emulsion paint for the exteriors and common areas..
Will there be validity for the Price List? Yes, the prices are subject to change. How are installments to be paid and is it time bound? Installments are to be paid by a way of postdated cheques which is a pre–requisite of the allotment. The schedule of payment is mentioned in the pricing list; the payment is not linked to the progress of construction but on a time bound basis as the delivery date has been established. If cheques are dishonored, the booking stands automatically cancelled. When do I get confirmed allotment? On payment of 20% and handover of post-dated cheques. We will issue an intimation letter acknowledging the receipt of the booking form and amount. You are then requested to handover the PDCs for the balance installments till possession within 30 days against which a formal letter of allotment will be issued. Agreements will follow. Step 1: Fill the booking application form. Step 2: Enclose the booking amount with the booking form and give it to our representative. Is there a clubhouse and what are the facilities? Is there different pricing based on the floors or orientation of apartments? Yes, we have differential pricing based on the level on which the apartments are located (Please refer to the pricing chart). Why would you want to miss out on such an unprecedented product offering? 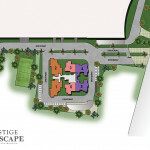 However if you do cancel after booking before executing the Sell and Construction agreement, then 1% of the Sale value of the apartment will be forfeited as a cancellation fee along with a deduction for any marketing fee paid, and the balance will be returned within four weeks without interest from the date of written request. After execution of the Sell and Construction agreement, the cancellation charge will be as per the agreement executed. Can two flats be bought and combined into one? Sorry, we really want to complete the project on schedule. Hence no combinations can be done. Are modifications permitted in the apartments? The specifications and designs have been carefully worked out. Considering the number of apartments and the delivery date, customization will not be possible in the collective interest of the purchaser. 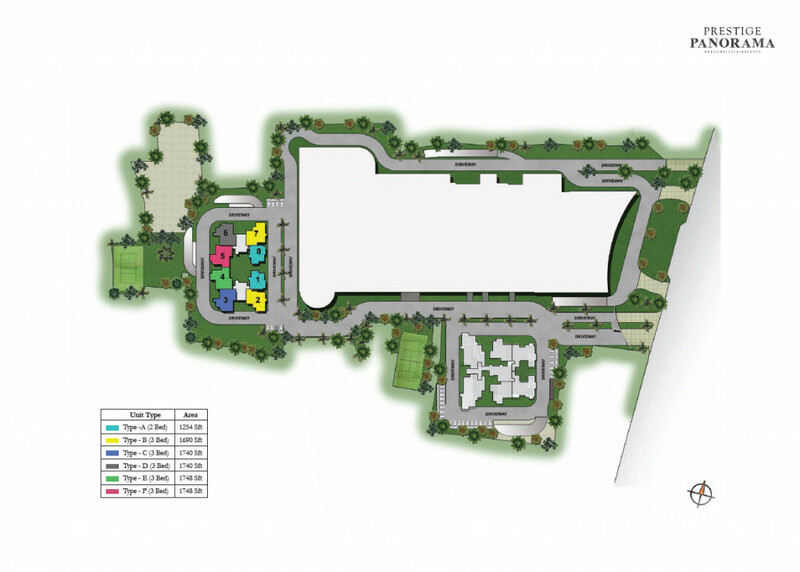 We can provide one car parking space for every apartment. Additional car parking will be allotted at additional cost at the time of possession depending on the availability only. Of course, you are dealing with Prestige. The land is freehold, marketable and free from all encumbrances. The development has been approved by all financial institutions. Has the sanctioned plan been obtained? What are the types of agreements to be signed by the purchaser? Standardized agreements to sell and construction agreement or a composite agreement for sake of the apartment will be issued to the purchaser. The Sale Deed will be registered on completion of the entire development and on payment of all amounts at the purchasers cost. What is the process of registration and when does the registration take place? Registration will be done only on the completion of the development and on the payment of the entire sale consideration, including the additional amounts. Registration will be facilitated by us through an advocate appointed by Prestige. What is the process of assignment? Assignment can be done only after the agreements have been signed, PDC is given and first three installments are cleared and the new party complies with the terms and conditions of the principal agreement. Transfer fee as applicable will be required to be paid. The assigner is to retrieve and handover to Prestige all letters and documents issued by Prestige to the HFIs to facilitate the loan if any, availed by the assigner. KSEB & KWA Charges, Registration Charges, Taxes as applicable, Sinking Fund, Advance Maintenance Charges, Generator Charges, Assessment Charges, , LWF and applicable taxes. Who will take care of the maintenance of the development? 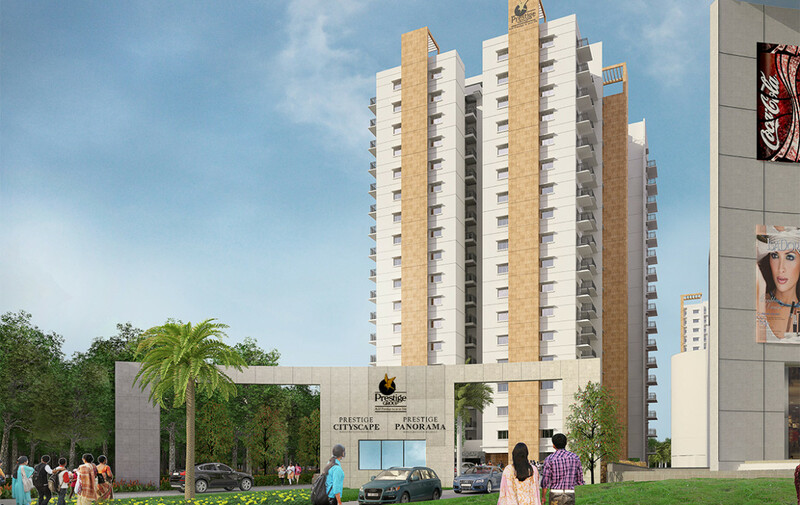 Prestige Property Management Services will be taking care of the property till Owners Association is formed. 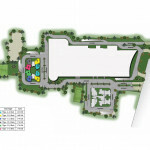 Now you can rest assured that the development will be cared by professionally. The scheme for annual maintenance is Rs. 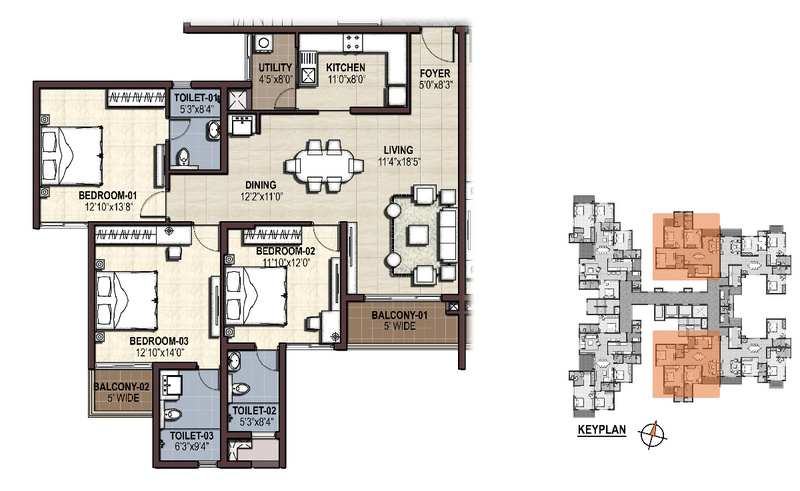 45 per sqft. A purchaser is required to pay Rs. 45/- per sq.ft. towards advance maintenance charges for the first year. Maintenance Charges after the deployment of the advance payment, maintenance charges will be collected quarterly in advance based on the cost and management fee incurred. Additionally, all purchasers will be required to pay a sum of Rs. 45/- per sq.ft towards the sinking fund which will be maintained in a separate ‘Escrow Account’, and the same will be used for any major maintenance in future. What is the purchasers responsibility for disbursement of installments through HFIs? It is the purchaser’s responsibility to ensure timely disbursement of installments from HFIs and no demand will be made by us to the HFIs for the disbursal of installments. To facilitate smooth payments, customers are required to issue a consent letter. Post- dated cheques for the installments will be returned on receipt of the institutional payment.